Tonight on CBS Madam Secretary airs with an all new Sunday, October 30, 2016, season 3 episode 4 called, “The Dissent Memo” and we have your Madam Secretary recap below. On tonight’s Madam Secretary episode Henry (Tim Daly) and Jose (Carlos Gomez) find themselves one step closer to locating the antiquities stolen by Hizb al-Shahid. Did you watch last week’s episode where Elizabeth (Tea Leoni) found herself in a stalemate with the Chinese foreign minister as she lobbied for the release of environmental activists who were arrested for spying in China? If you missed it, we have a full and detailed recap right here for you. Madam Secretary is definitely one series that you don’t want to miss and neither do I. 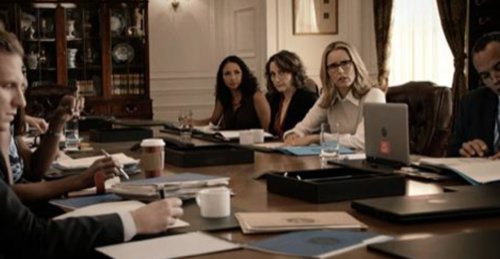 So make sure to bookmark this spot and come back between 9:00PM – 10:00PM ET for our Madam Secretary recap. While you wait for the recap make sure to check out all our Madam Secretary spoilers, news, recaps & more! Russell calls Elizabeth to his office, he wants to talk about Dalton’s campaign as an independent. If they don’t win over Minnesota and Ohio, they a kiss any chances of him winning goodbye. Technically there are legal ramifications about campaigning, but Russell wants Elizabeth to attend a NFL game in one of the states and do an interview. Elizabeth heads back to her office, and the Ambassador from Angola is waiting for Liz and is not happy. She serves Elizabeth with a letter of dissent. Apparently, Angola is not happy that the US cares more about the bombings in Rome than the bombing in Angola, which killed twice as many people. She explains to Elizabeth that they think that President Bestillo is behind the bombing in his own country because he didn’t want to lose the election to the new candidate. Elizabeth heads to the conference room where Nadine is briefing her staff – they have put the interview at the NFL game in Cleveland on her schedule. Her team is concerned because legally she can’t campaign, and there are only so many things that she can say about Dalton running as an Independent. Elizabeth shares the details of her meeting with the woman from Angola. She tells her team to look for possible things the US can sanction Bestilo with. Elizabeth chases down Russell and tries to talk to him about Angola, she wants to cut off imports, Russell rants that she can’t do that while they are trying to win over Minnesota and Ohio. Russell tells Elizabeth to stay out of it and let Angola deal with it. Elizabeth heads back to her office and video chats with President Bestillo – she tells him that in order to continue supporting Angola, the US needs to know that he is looking out for the people of Angola. Bestilo basically laughs off Elizabeth’s threats and tells her to have a good day and worry about her own election. The next day, the NY Post publishes an article about the dissent memo that Liz was served with because the US was not looking out for the people of Angola. Elizabeth heads to Ohio for her NFL interview and she nails it. Afterward, she chats with a potential donor who is the creator of a social media App. Russell whisks her away and says that her interview was great, but it probably won’t matter because now the NY Post’s article about the dissent is ruining their chances. Liz heads to the office the next morning and all hell is breaking loose. Susan barges in and announces that she leaked the dissent memo to the press, she also promptly resigns. She is furious that the US is sitting back and blindly ignoring the fact that Bestilo is stealing the election in Africa, all while Liz is jetting off to football games and campaigning for her own election. Elizabeth sits down with Susan and they manage to work things out, they hash out a plan to play hard ball with Bestilo. With Susan’s help, Liz calls the President back and threatens him that she will ban all Angola residents from entering the US, which would mean his daughter couldn’t attend college at Stamford anymore. She also blackmails him about an illegitimate child he has – hopefully, that will convince him to allow his people to have a far election. Meanwhile, Stevie takes her mother’s advice and sits down with Jarith and they have a chat about how much she hated their trip to England. Jarith apologizes for his behavior, he doesn’t want to lose her. He decides to cancel his fellowship and finish school in the US so they don’t have to move abroad. However, Jarith’s family is not impressed that he is throwing his career away and threatens to cut him off. Meanwhile, Stevie takes her mother’s advice and sits down with Jarith and they have a chat about how much she hated their trip to England. Jarith apologizes for his behavior, he doesn’t want to lose her. He decides to cancel his fellowship and finish school in the US so they don’t have to move abroad. However, Jarith’s family is not impressed that he is throwing his career away and threatens to cut him off. Elizabeth heads to the office the next day and gets more bad news. Apparently, Bestilo wasn’t too scared about her threats, and he cut off all internet in Angola the day of the election to ensure that he wins. Elizabeth isn’t ready to give up though. She calls Scott, the tech guru she met at the NFL game. Apparently, he has the knowledge and tools to set up a free internet service in Angola that the government can’t shut down. She tries to convince him to help her, and the people of Angola. Scott comes through and gets WIFI set up in Angola just in time for the election. Elizabeth and her team watch the Angola election with Susan from their office via live feeds set up on the country’s all new internet service. At home, Stevie and her dad chat about her and Jariths relationship, and his decision not to return to England. Stevie is scared that Jarith is going to resent her for staying in the US. Henry gives her some marriage advice, and tells her that she and Jarith need to work through it now. Elizabeth and her team are still sitting around their computers waiting for the results. The polls are finally tallied, and Angola just elected their first woman president, Bestilo is officially out of office. Russell stops by and has more good news – Dalton is officially on the ballots in Ohio, it looks like Elizabeth’s NFL interview helped after all. Henry and Jose have sent an agent in undercover to meet with the terrorists as an art appraiser. The meeting goes well and she is in. Henry and Jose watch the camera feed and out of nowhere someone grabs their undercover agent and tosses her in to a van.